Collegeville, Pa carpet cleaners, rug cleaning services. Thank you for choosing Angelo’s Carpet Cleaning! We know that there are a lot of other Collegeville, Pa carpet cleaners and that’s why we always strive to give you the best possible service at a reasonable price. Cleaning wall to wall carpeting in your home is essential for your family’s health. If you have kids and / or pets, your carpets can become dirty fast! Vacuuming carpets can help if done regularly, but a deep and thorough professional carpet cleaning is necessary to really remove grime and allergens. Many rug manufacturers maintain that to care for a carpet, it should be professionally steam cleaned or dry cleaned regularly. This will provide a longer life for your carpets and a cleaner house for you and your family. If you just purchased a new home, a thorough carpet cleaning and disinfecting will give you a fresh start and ensure that years of dirt, dust, pet hair and odors and allergens will be eliminated before you move in. 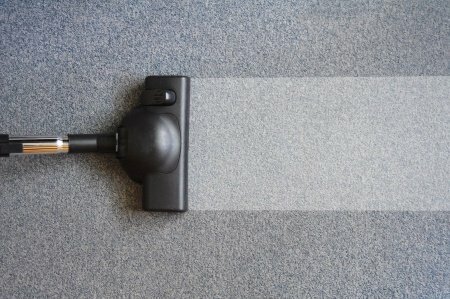 Have you have noticed that your carpet is dingy even after vacuuming? Does it have a musty odor or stains? It may be time for a cleaning! Angelo’s Carpet Cleaning has a motto “If a spot comes back, so do we!” Our cleaning services always include our 30 Day Satisfaction Guarantee and 6 Month Warranty. Our equipment is environmentally friendly and uses less water than other systems by releasing only 3-6 gallons of water per room of carpet cleaned. This also means less waste water and a quicker dry time. 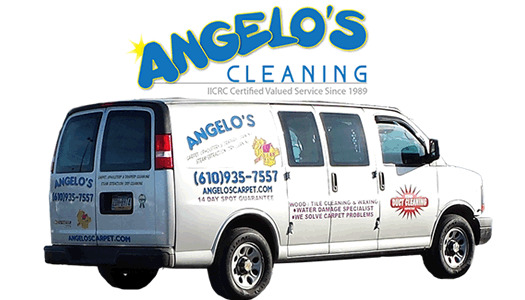 For over 25 years we have helped countless homeowners and businesses in Collegeville and we want you to make Angelo’s your Collegeville, Pa carpet cleaners. 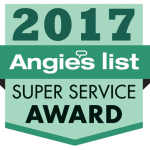 We have a huge amount of excellent reviews and invite you to view our company on Angie’s list carpet cleaning reviews. We are trained and certified by the IICRC (Institute of Inspection, Cleaning & Restoration Certification) and our technicians are fully trained before being certified. Soil in High Traffic Areas – dirt and grime can be ground into carpets over time, especially in hallways and on carpet stair runners. Allergens and Pollen – if you suffer from allergies, we can significantly reduce allergens in your home’s carpets and rugs. Dust and Dust Mites – although not nice to think about…another cause of allergic reactions can be found in the dust and eggs that dust mites lay. Regular vacuuming is effective, but for many allergy sufferers a professional rug cleaning is the best weapon in fighting allergies! Animal Hair and Pet Dander – your pet’s hair can slowly get tangled in the fibers of your carpet. Pet dander is another cause of allergies. Spots or Stains – cleaning a spot in your carpet can be attempted when it first happens with a natural spot removing method such as vinegar and water, but many spots are ground into the fibers of the rug and will require a professional cleaning to remove. Angelo’s Cleaning offers many other cleaning services for your home or business. By using proven methods and quality cleaning products at competitive prices, we guarantee you will make us your cleaning company. Including: upholstery cleaning, wood floor cleaning, drapery cleaning, allergy treatments, vent cleaning dryer vent cleaning, Since 1989, we have been providing a variety of services including repairing carpets, removing pet odors from your home, and Scotchguarding fabrics. In addition to these services, we also offer emergency water damage and flood services. Your satisfaction is guaranteed! We are based out of Phoenixville, Pa and offer fast service to our neighbor. We hope you will make us your Collegeville, Pa carpet cleaners. Please try our new online shopping cart feature to check our prices and take advantage of our online specials!